Source cell-phone identification has become a hot topic in multimedia forensics recently. In this paper, we propose a novel cell-phone identification method based on the recorded speech files. Device self-noise is considered as the fingerprint of the cell-phone, and the self-noise is estimated from the near-silent segments of recording. Moreover, two categories of spectral features of self-noise, i.e., spectral shape features (SN-SSF) and spectral distribution features (SN-SDF), are extracted for closed-set classification using SVM classifier. Experimental results show that the self-noise has the ability to identify the cell-phones of 24 different models, and identification accuracies of 89.23% and 94.53% have been obtained for SN-SSF and SN-SDF, respectively. 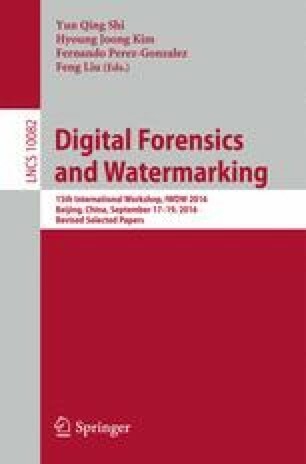 To the best of our knowledge, it is the first attempt to comprehensively define the self-noise of cell-phone and furthermore apply it to source identification issue of audio forensics. This work was supported by the National Natural Science Foundation of China (Grant No. 61672302, 61300055), Zhejiang Natural Science Foundation (Grant No. LZ15F020010, Y17F020051), Ningbo University Fund (Grant No. XKXL1405, XKXL1420, XKXL1509, XKXL1503) and K.C. Wong Magna Fund in Ningbo University.